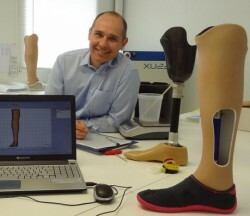 The innovative prosthesis wraps created by Aqualeg, a member of the Atlanpole Biotherapies cluster, have been included in the list of the French “Social Security” Reimbursable Benefits under a brand name. This new reference creation is quite unusual; in general, it is reserved for the 20% of medical devices deemed to offer an improvement in the expected service compared to existing solutions. The new Aqualeg reference and the new price were created after an administrative procedure, tests and clinical studies that lasted more than two years. It is an important recognition and a key step for this Nantes company which aims to extend this standardization to other countries. By 2018, Aqualeg is aiming at an annual turnover of 2 million euros, with a team of about ten people. Important developments are expected abroad, in Europe in the short term, and then in increased exports.